One is called the payroll survey. It asks mostly large companies and government agencies how many people they employed during the month. This survey produces the number of jobs gained or lost. In July, the payroll survey showed that companies added 172,000 jobs, and federal, state and local governments cut 9,000. The other is the household survey. Government workers ask whether the adults in a household have a job. Those who don’t are asked whether they’re looking for one. If they are, they’re considered unemployed. If they aren’t, they’re not considered part of the work force and aren’t counted as unemployed. 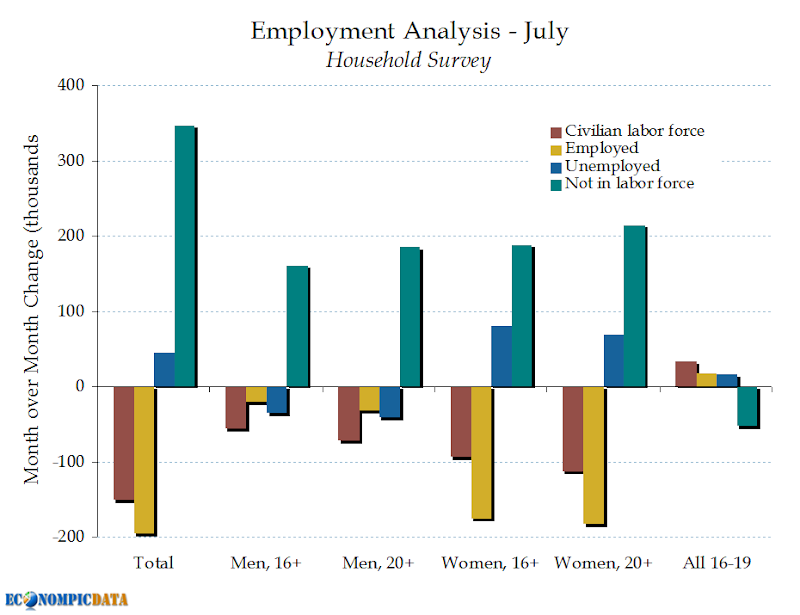 The household survey produces each month’s unemployment rate. In July, the household survey showed that the number of people who said they are unemployed rose by 45,000. In a work force of155 million, that doesn’t make a big statistical difference. But it was enough to raise the unemployment rate to 8.3 percent from 8.2 percent in June. Unlike the payroll survey, the household survey captures farm workers, the self-employed and people who work for new companies. It also does a better job of capturing hiring by small businesses. But the household survey is more volatile from month to month. The Labor Department surveys just 60,000 households, a small fraction of the more than 100 million U.S. households. Looking at the data, the household survey was even worse than that. Not only did the number of unemployed rise by 45,000, the number leaving the workforce spiked (resulting in the number employed dropping significantly), resulting in the unemployment rate rising despite the better headline number.